You do not need to know what pivot bands are to use my trading methodology. However, I did want to illustrate some other indicators I look at. This is a chart of the $ES_F (S&P500 future) with pivot bands(energy bands of resistance and support). I have posted some notes showing how an “exhaustion sell pattern” worked today. Is pivot bands the same theory as ” pivot points” that are used on most charting software? Hi, do these pivot points learnings apply also to individual stocks, i.e. AAPL? Should we expect similar behaviour from big liquid stocks? thanks! 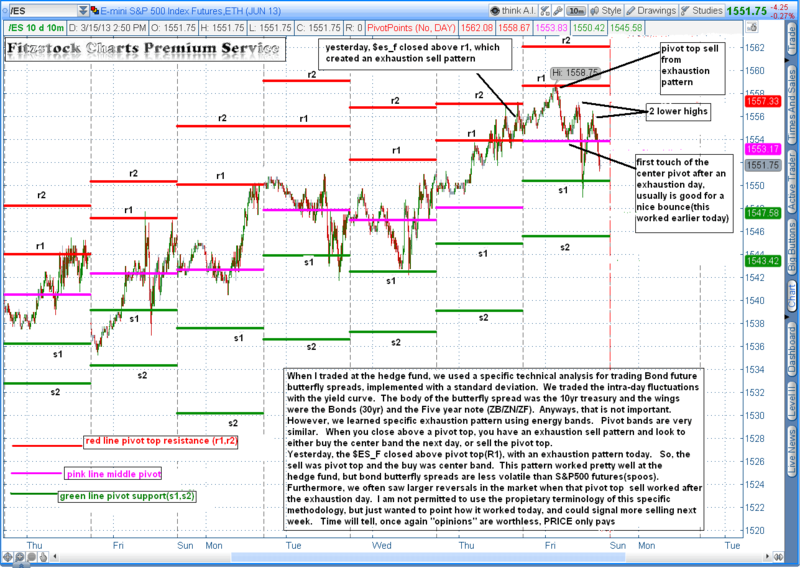 I do not trade pivot points with equities.